Ellen Mulligan is a ceramic artist making pottery for everyday use. 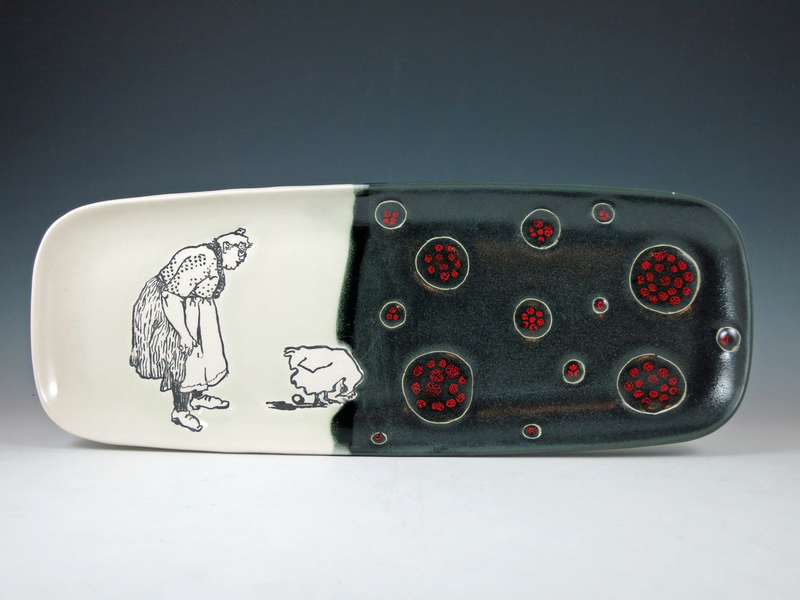 She works in porcelain and stoneware, and enjoys using imagery on her work. "I grew up with my Grandmother's gift to a large family, a lifetime subscription to National Geographic. All those beautiful older issues, with the scrolling on the front cover, like money. In a crazy, busy household somehow sneaking off for some quiet time, with a cup of tea, is connected with paging through those issues, seeing the world from the kitchen table. I connected this peaceful, quiet feeling with my pottery, and maybe how I would like to see it used. So my first attempts were colored slip brushwork inspired by images I saw in the National Geographic (yes, I got a subscription) - birds, children, just a stray image from a very strange, exotic world. "Pottery has been unbelievably rewarding for me. Seeing my tableware in daily use makes it all fall into place. 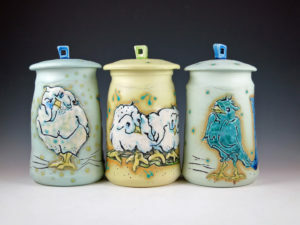 I like to imagine my pots stacked in the dishwasher -- sturdy, dirty and well-used. They can be used for a Thanksgiving dinner, mid-week takeout or morning cereal." 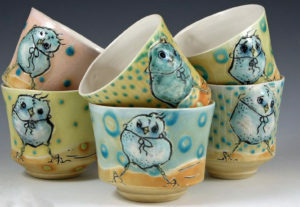 Ellen is a member of Underground Potters, Potters' Guild of NJ, Tomo Potters and the Potters Council, and shows her work at Gallery 23 in Blairstown, NJ.